American yard Bering Yachts has announced that it has sold its largest yacht to date in an in-house deal. The owner is described as an experienced European client who is trading up from an 18 metre motorsailer. Known as the Bering 92, this new model measures 28 metres LOA and will be built from a full-displacement steel hull and aluminium superstructure to an in-house design. The yard adds that the construction of this tri-deck motor yacht will begin next month with the aim of launching the Bering 92 in December 2018. 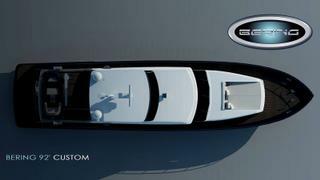 The new flagship of the custom range will be personalised to meet her owner’s wishes, with high interior volumes and an “elegant and timeless” interior décor. Accommodation is for up to eight guests split between four cabins, including an amidships owner's cabin, VIP suite and two further cabins. Meanwhile, the crew quarters is situated aft with space for up to four people. Power will come from a pair of 410hp Cummins QSL engines that will allow for a top speed of 13 knots. When trimmed back to her cruising speed of 11 knots, the Bering 92 will boast a maximum range of 3,500 nautical miles, drawing on a total fuel capacity of 15,000 litres. No further details have been released at this stage, but as the teaser image above shows, she will sport a large foredeck sunpad and enough room for storing a superyacht tender on the upper deck aft. Other projects currently under development at the American yard include the Bering 70 yacht Project Apsara and the Bering 65 yacht Golden Mile, which is due to launch later this month and make her public debut at the 2017 Cannes Yachting Festival.